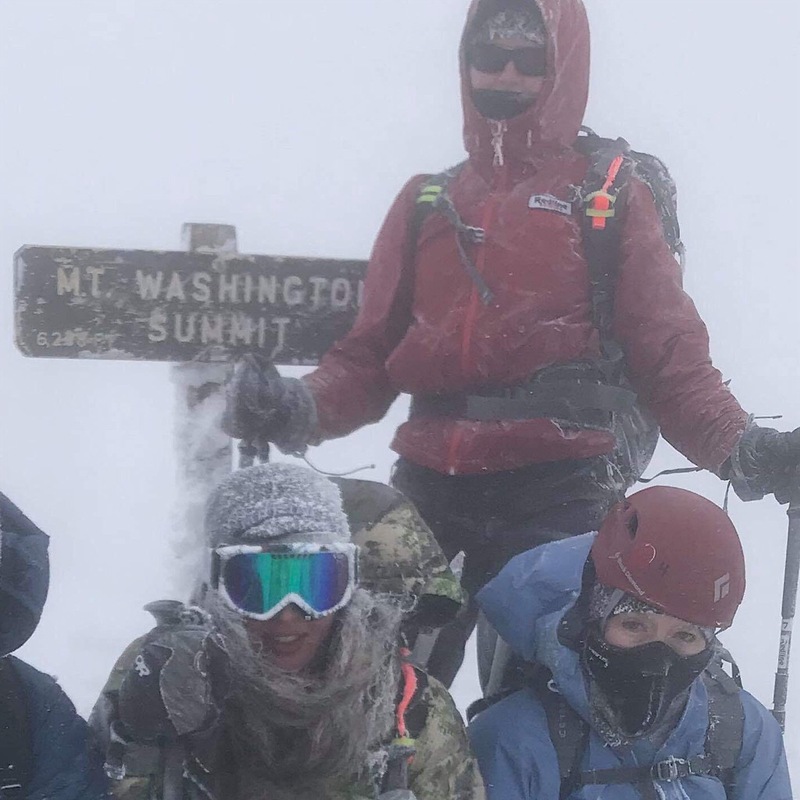 Clear skies yielded to clouds, calmness became the wind, and through it all a team of four persevered and made it to the cloud shrouded summit of the 6288′ Mount Washington. 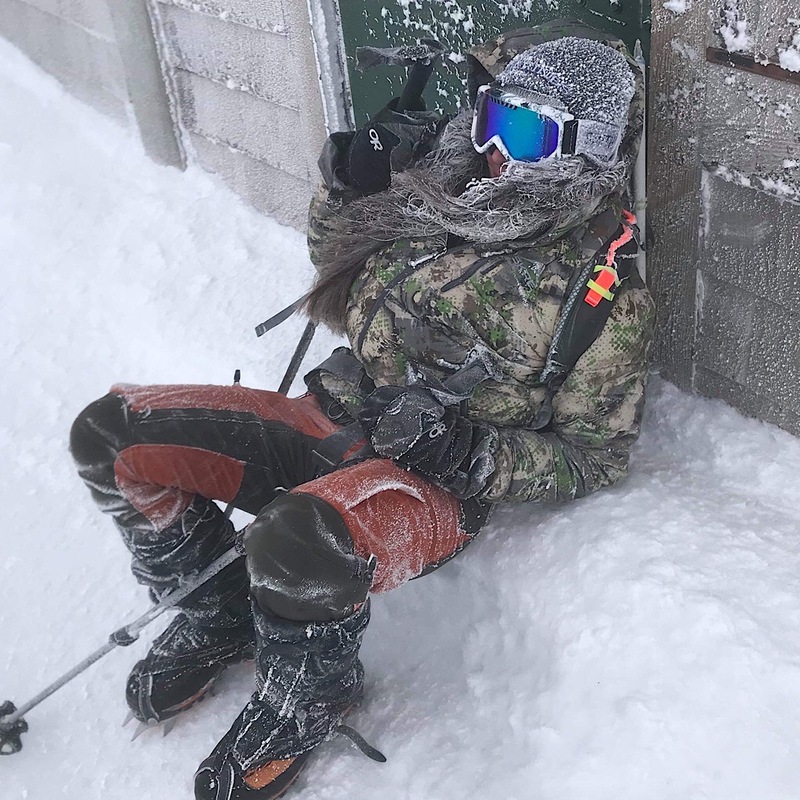 One climber, interviewed after the adventure, declared it to be the toughest thing they had ever done and that their muscles were very, very sore. They went on, however, to express that they felt no regret among their physical pains. They knew they dug deep to make it, but now felt pride over the accomplishment. Would they do it again? Well, it’s type two fun — meaning you might hate the activity or at least suffer while you’re doing it, but will remember it fondly for decades after — so ask later. Not everyone, however, made it. 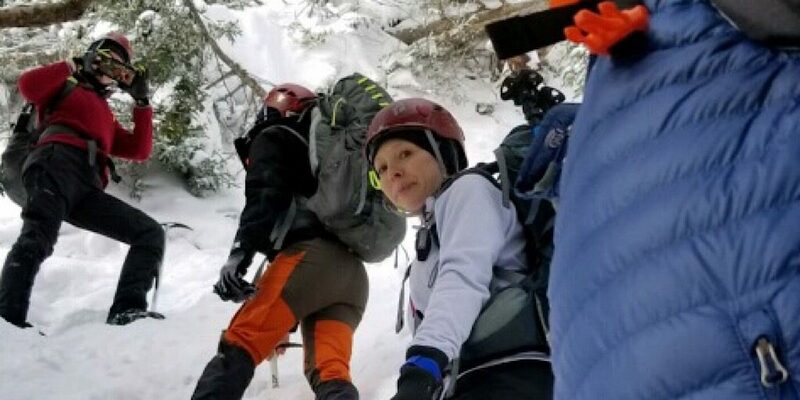 One team member, the fifth member, who we knew was recovering from an illness, felt unable to go on while still within sight of the AMC’s Pinkham Notch Visitor Center. This person unselfishly thought of the entire team knowing that they could negatively affect the outcome, or worse, endanger the others. A true team player! They wanted to stroll back to the building so we let them. On lead for this tour were Redline Guides Jeffrey Shutak and Ryan Mcguire. 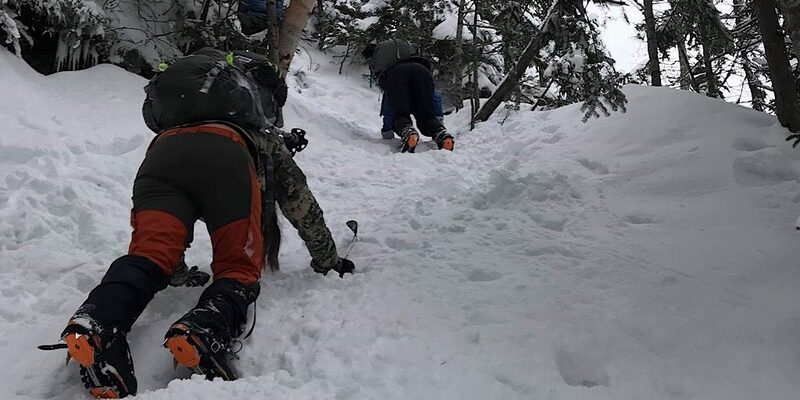 Two different guides with two different approaches, but with a unified goal for the day: get as much of the team to the top as safely as possible. 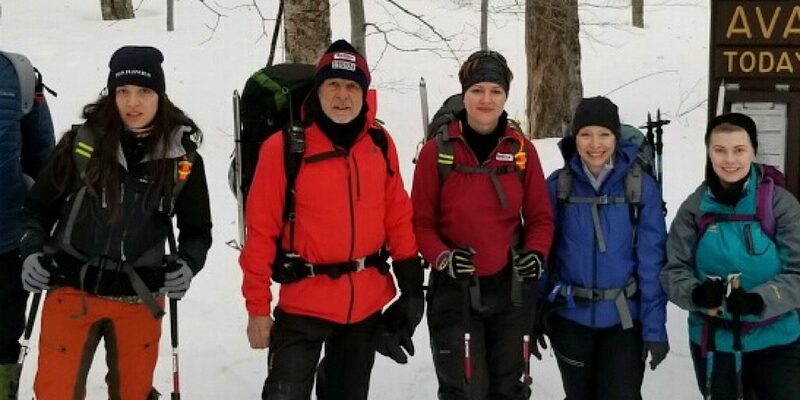 They did well, despite having to deal with a rogue hiker with improper traction sliding into one of our team during the descent. Nobody was hurt, thankfully. It is fairly common to witness questionable behavior on that mountain and on that trail. 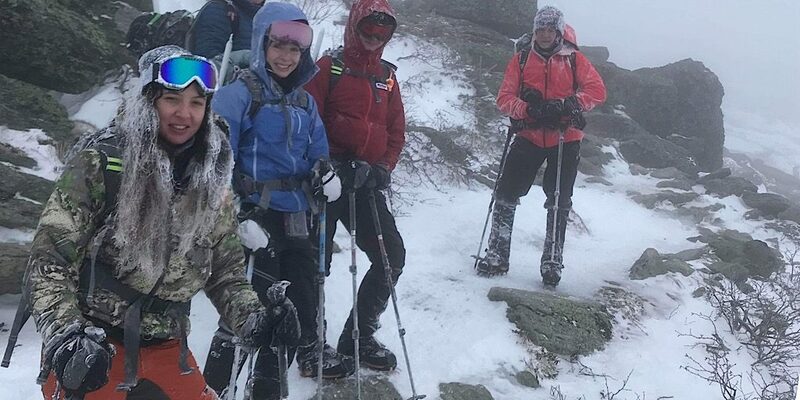 Prior to the team’s summit bid, racing a warm front, in what Jeffrey described as some of the nastiest raw, windy weather he had ever felt on the mountain, the team prepared with our Winter Skills and Mountaineering Skills courses with Jeffrey, Ken Hodges, and owner Mike Cherim doing the teaching. While more training is always needed, and practice is always required until muscle memory takes the reins, this day of training really helps set the stage for success the next day and for many adventures to come. The team didn’t train alone. Along with the five preparing for the Rock Pile where four members of the Rhode Island Hiking Club, of which three were also sticking around for a second day with us (for a Glacier Skills course). 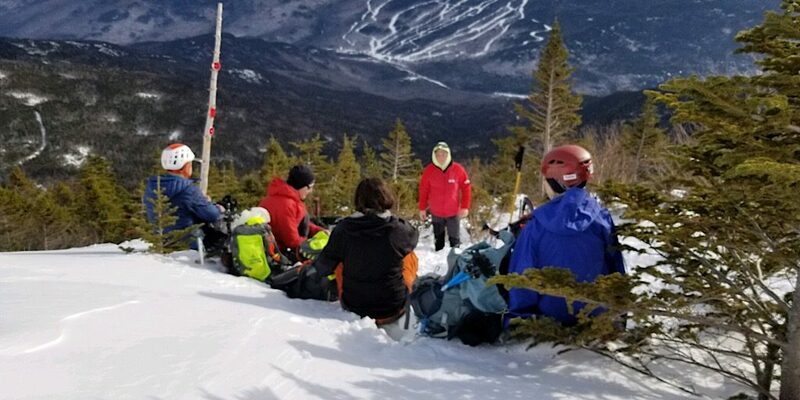 Excluding the glacier skills images, here are a few photos from the weekend with our second Ridj-it group of the season. 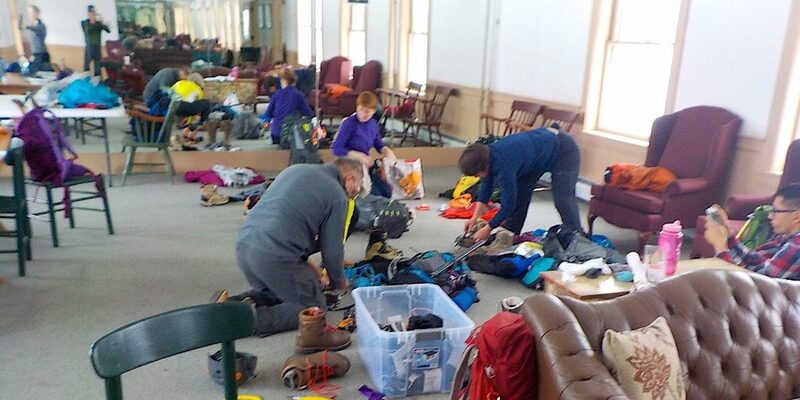 Preparation and the honing of skills. Participants from both groups line up on our self arrest training hill. For more training images, see this Facebook album. Here the team stands with Jeffrey at the start. One member is intentionally not visible as per his privacy preferences. 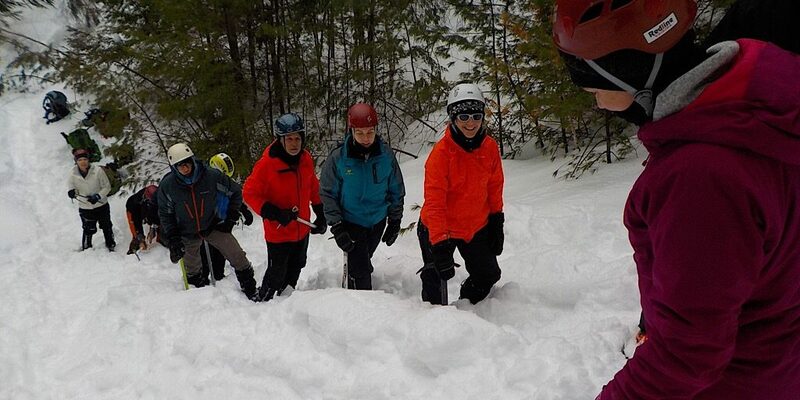 After the slog to get there, the team finally addresses the steeps. Up they climb, this image capturing the high angle well. 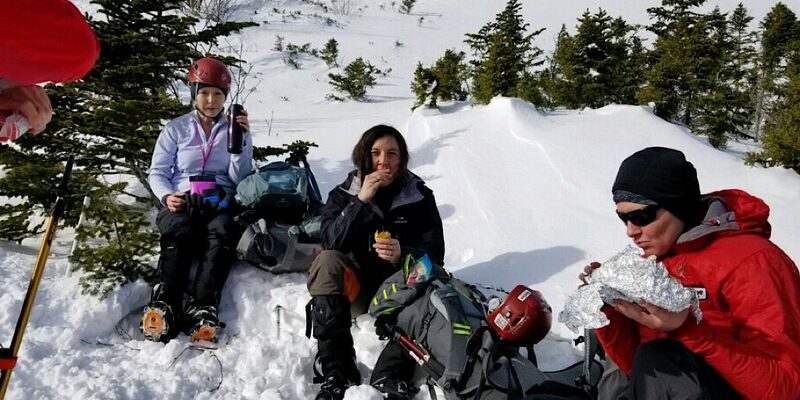 A well deserved treeline break. Ryan chats with the group. Note the wonderfully clear weather. That will change. 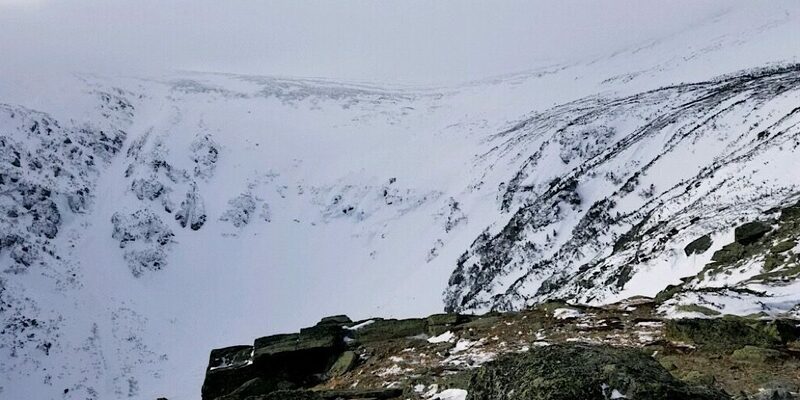 Tuckerman Ravine. 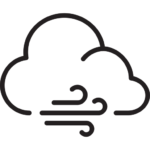 As you can see, conditions are changing, above them a blanket of cloud will soon meet them. And just like that, conditions change. Nothing we’re not prepared for, thankfully. “I thought pea soup was green,” he shouted! Or something like that. 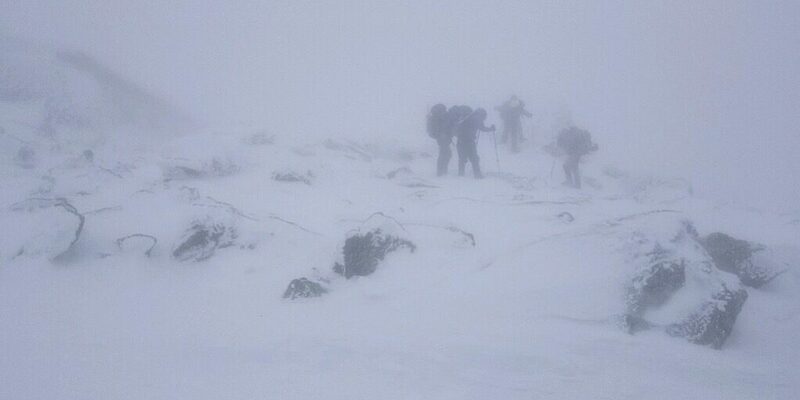 Our team on the summit. One member relaxes, taking in the sights, enjoying a serene, quiet moment in the mountains. Well done everyone. Good lead Jeffrey and Ryan.